« Lá breithe shona duit! It is the MOST delicious fragrance, isn’t it? And very hardy. Makes a nice plant to grow between paving stones…I’ve never made tea out of it, though. Back when I lived in the Netherlands, we would go out to the fields in summer and collect bags of chamomile flowers, enough to ensure a stable supply of tea for the whole winter to come. Absolutely delightful. That’s so great! 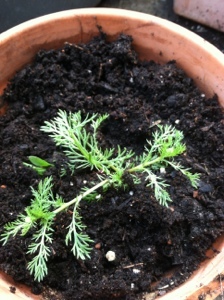 I’m growing Chamomile in my garden and it’s so beautiful. I have a question: this is my first time ever growing Chamomile and making tea fresh from the plant. Is it the flower or the leaves you use to make tea?